It’s kind of a general two-minded state people face when deciding whether or not to become an entrepreneur. It’s a risk, no doubt and the roadblocks offered are not too easy to handle. What the journey ends up being is that a person with a brilliant idea never brings it to fruition, and with today’s rapid growth, somebody else surely picks it up, nurtures it and earn a fortune. 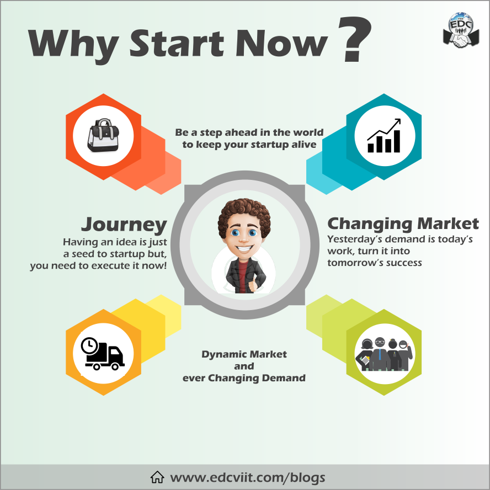 So, it’s important to realize that for a start-up, the time is now! Having an idea is just the seed for a start-up, you need the fertilizers, water and nutrients of a wide variety of domains to grow that into a tree and expect some fruits. Working out the technical aspects, logical glitches, financial model, investments, sponsorships, market research are just some of the aspects that need to be taken care of to materialize an abstract thought. This is a journey that has to be started as early as possible so as to reach the destination in time. No doubt there are people who go through mid-life crisis and emerge on the other side as successful and rich entrepreneurs, but that’s a risk with statistics indicating more failures. Instead, why not take a risk of putting all your skills and mental faculties into an idea that would someday bear lucrative fruits for you and the society. In today’s era, it’s been a shift of trends where the more successful start-ups are mostly service providers. They don’t own any product but are still continuously printing money with their service. When you don’t worry about the technical aspects of your product, its working and feasibility in the market, that’s a burden off your mind. Providing services to your customer is nothing short of social service. You don’t have to worry work about hours as it’s going to be 24 hours a day to provide help and the expansion can truly be global. Providing help for anything was the necessity in the past, is the same case today and will be no different in the future. But the additional edge you get by starting today is the uniqueness of your service. At a time in the past, online cab services were non-existent, online shopping was never thought of and basically having all kinds of different people ready to help with just a phone call, a wild fantasy. But today these things are pretty much there and are just growing, spreading out into all other sectors. You have to be a step ahead to stay alive with your start-up in the future. Anything that makes people's lives easier will no doubt find a market. There’s no one as erratic in behaviour and their demands as the customer. While there is no task as simple as tying your shoelace, “Back to the Future” pushed certain fans into creating the self-lacing shoes from the movie that were thought of as pure fantasy. Although not a very problem-solving product, the demand for it yesterday, working on it today, made it a successful venture tomorrow. This is the exact thing that happens day-in and day-out, a customer never gets satisfied and keeps expecting something different. Now is the age of start-ups and that’s common knowledge. This gives incentive to upcoming entrepreneurs to push themselves beyond limits and finally satisfy the customer. Innovation is the routine for an entrepreneur and only by staying in the game long enough, you can expect to get something right, something good. Today there is a demand in the market for something, tomorrow it will be wholly different and even later, would be something unfathomable. Then is it not a safer bet to work on the current demands and solve the current problems, than to wait for a tougher one and fail miserably at it. As it is said, for some things, it’s now or never. With such dynamic markets and ever-changing demands, it is better to take a small step now than to go for a leap later on and ending up in trench, never to recover. Go ahead and bet on yourself, you won't find a better time.